The second edition of the plough is now a simpler affair, losing the support rods and now just being mounted on the rear tractor pick-up arm. 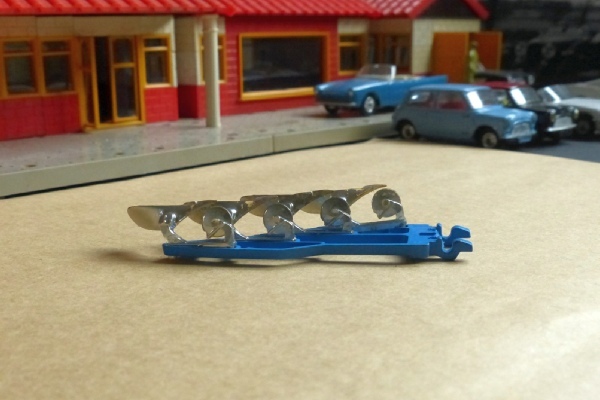 It is now blue and has silver-plated shares in place of the yellow plastic ones. On its own this is an inexpensive item but pair it with a Fordson Super Major Tractor in Gift Set 13 and it becomes quite costly. Add a box and it commands nearly £300! This example has excellent blue paintwork and the silver plating is good with just a little tarnishing on some shares.